First things first: #19 is probably the hardest of them all. Having to leave off this list the likes of Larry Robinson, Jean Ratelle, Butch Goring, and Markus Naslund is no small feat. Especially Robinson, who many could argue should be in the Top 3. However, Trottier gets the nod for third place. He came into the league at age 19 after being drafted in the Second Round (22nd overall) of the 1974 NHL Amateur Draft. In his first season (1974-76) he set a league record for rookies with 32 goals and 95 points, nearly leading his team in scoring (only defenseman Denis Potvin (98) had more points). Trottier really began turning heads in his third and fourth seasons when he led the NHL in assists for two consecutive years, also winning the Art Ross in the latter. 134 points would be a career-high for Trottier. It also earned him the Hart Trophy as league MVP. In 1982, Trottier scored a career-high 50 goals in the regular season, also notching his second highest points total of 129. From 1980-83, the Trottier and the Isles would win four consecutive Stanley Cups. The first three regular seasons in those years saw Bryan score 100+ points, a feat he would accomplish a total of six times. But as good as he was in the regular season was as good as he was in the post-season as well. In the 1980 playoffs, he led by example, scoring a league-leading 12 goals and 29 points in 21 games where he won the Conn Smythe Trophy as playoff MVP. In 1981, he also scored 29 playoff points, leading the league with 18 assists. In 1982, he led the league in playoff assists (23) and points (29). All this nearly makes his non-league-leading 20 points in 17 games in the 1983 post-season seem mediocre. The Islanders didn’t just win. They raised it to an art form. In 1982 and 1983 combined, they swept four series including two Semi-Final Rounds and one Stanley Cup Finals Round. In 1984, they nearly won their fifth straight Cup, losing to the upstart Edmonton Oilers, who would win the first Cup before forming a dynasty of their own. They would not advance to the Finals for the remainder of Trottier’s tenure there. In 1990, he signed with the Pittsburgh Penguins. In his first two seasons with the Pens he won Stanley Cup numbers five and six. He was 34 years of age when he joined the team, and was beginning to slow down in terms of point production. Trottier did however provide much needed veteran leadership. On a team that included (in order of regular season point production) Mark Recchi (22), John Cullen (26), Paul Coffey (29), Kevin Stevens (25), Jaromir Jagr (18), and Mario Lemieux (25), Trottier was the oldest player on their roster. He still was able to provide 14 points over the two post-season playing in a much lesser role, adding to his already impressive playoff career. In 221 playoff games he accumulated 71 goals and 184 assists. His career regular season stats are even better. He ranks 23rd all-time in points-per-game: 1.114. He holds Islanders records in career games played (1123), assists (853), points (1353), and plus-minus (+470). 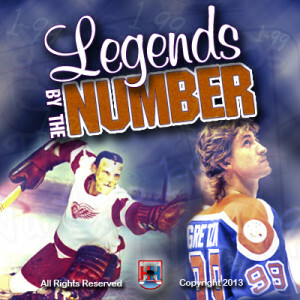 Before pesky Wayne Gretzky came around, Trottier held the record for youngest player to reach all point milestones (each century mark from 100 to 900). He also ranks 16th all-time in points (1425), recently being passed by Teemu Selanne. After he retired in 1994, he even played roller hockey for a season! He would be inducted to the Hall of Fame in 1997, in his first year of eligibility. His number nineteen jersey was inducted by the Islanders organization in 2001. Joe Sakic was drafted 15th overall in the 1987 NHL Entry Draft by the Quebec Nordiques. If you just read #3 on this list, you can draw comparisons between Trottier and Sakic. Beside the fact that they wore the same number and spent their entire career with one franchise (for the most part), they were both 5-11, 195 pounds. Their career stats almost line up, especially looking at their playoff totals. He would make his rookie debut at age 19, like Trottier. In that season he scored 62 points in 70 games. That point total would stand as the lowest production of his career, ignoring his last two partial seasons. The next year he scored 100+ points for the first of six times in his career. The next year proved even better, as he scored 48 goals and 109 points. In his third season, he was named co-captain, serving as captain for every road game. He would become full-time captain for 1992-93, at age 23. In his first year as team leader, he led the lowly Nordiques for the first time since he arrived in Quebec. The previous four years saw them finish dead last in their division. Following the 1994-95 campaign, the Nordiques would be relocated to Colorado, where they became known as the Avalanche. In their very first season in Denver, Sakic scored 51 goal and a career-high 120 points as the Avs finished first in their division and second in the NHL. In the ensuing playoff run, Sakic led the league with 18 goals and 34 points in 22 games. He nearly single-handedly carried his team to the Stanley Cup Finals, scoring 12 points more than the next-best performer. After disposing of the Vancouver Canucks, Chicago Blackhawks, and Detroit Red Wings in six games each, they swept the Florida Panthers to win the franchise’s first Stanley Cup. Sakic was awarded the Conn Smythe as playoff MVP. In 1996-97 they advanced to Round 3, only to lose to their fierce rivals the Detroit Red Wings, whom they had defeated the previous year. Sakic led all playoff scorers with 17 assists. In 1999 and 2000 they also advanced to the third round, only to lose to the Dallas Stars in seven games both times. The 2000-01 season proved to be one of Sakic’s best seasons of his career. He scored a career-high 54 goals (a league-leading 12 of which were game-winners) and nearly broke his personal-best in points with 118. He was awarded the Hart Trophy, the Lady Byng Trophy, and the Lester B. Pearson Award in the same year. In the 2001 post-season, Colorado would once again win the Cup, aided by Sakic’s league-leading 13 goals and 26 assists. The following year, they would experience déjà vu as they found themselves facing the Detroit Red Wings in the Conference Semi-Finals as they attempted for the second time to win back-to-back Cups. Detroit would emerge victorious again, as they went on to win the Cup for the second time following an Avalanche championship. What Sakic will be remembered most for in 2001, is handing Lord Stanley’s Mug first to Cup-starved defenseman Ray Bourque before hoisting it himself. Joe would finish his career with 188 points in 172 playoff games. He ranks 7th all-time in playoff goals (84), and 8th in points. He ranks 3rd all-time in playoff game-winning goals. His place on the all-time regular season scoring list is very similar. He ranks 15th all-time in goals (625), 12th in assists (1016), and 9th in points (1641). On the international stage, Sakic would win Olympic gold in 2002, scoring seven points in six games as Canada defeated Team U.S.A. in the championship game. He played in two World Championships, two World Cups, and two more Olympics, accumulating a total of 22 goals and 41 points in 48 international games. He would also be selected to play in 13 NHL All-Star Games. He retired following the conclusion of the 2008-09 season. His number nineteen jersey would be retired by the Avalanche organization before the start of the next season. Sakic was inducted to the Hall of Fame in 2012. Steve Yzerman has many similarities to the aforementioned players as well. At 5-11, 185 pounds, just 10 pounds separated him from Trottier and Sakic. Yzerman too played his entire career in the same organization. Like Sakic, Yzerman was team captain for a long period of time. In the process he accumulated some very similar numbers and accomplishments as well. He chose to wear #19 in honor of Trottier. Steve was drafted four years before Sakic (1983), being chosen fourth overall by the Detroit Red Wings. Unlike Sakic, Detroit needed Yzerman to step in immediately to help the team win. The team had just finished the “Dead Wings” era and needed someone to save the team. Their playoff appearance streak had not begun either. In his rookie season (1983-84), Yzerman scored a team-leading 87 points, 39 of which were goals, in 80 games. With his help, Detroit reached the post-season for the first time since 1978. In fact, from 1967 to the year before Yzerman was drafted, the team made the playoffs a total of two times, losing in the quarter-finals both times. At the start of the 1986-87 season, the Red Wings made NHL history, making Yzerman the youngest captain in league history at 21 years, 151 days old (Vincent Lecavalier, Sidney Crosby, Jonathan Toews, and Gabriel Landeskog, the current record holder, would later hold break the record from 2000 to 2012). In his first season as captain, Steve scored 90 goals. He would score 100+ points in each of the next six seasons. His career-high in all three main offensive categories came in 1988-89, when he scored 65 goals, 90 assists, and 155 points. After missing the playoffs in 1990, 1991 became the start of their playoff appearance streak, which currently stands at 22 straight post-seasons. Only four teams (Montreal, St. Louis, Chicago, and Boston) have had longer streaks than Detroit has. In 1995, the Red Wings made it to the Stanley Cup Finals in just 14 games, losing just two in the process. They would however, get swept by the New Jersey Devils in the Final Round. 1996 saw Detroit advance to the Third Round, only to lose to the Colorado Avalanche in six games. In 1997, they would return the favor, with Yzerman captaining the Wings to their first Stanley Cup in 42 years. Not many players have had such pressure on their backs to win as Yzerman did. The following post-season he helped them to win back-to-back Cups for the first time since 1954/1955. He led by example, scoring a league-leading 18 assists and 24 points in 22 games. He was awarded the Conn Smythe as playoff MVP. He will always be remembered for his selfless gesture of handing the Cup first to defenseman Vladimir Konstantinov, who was severely injured in a car accident not long after the 1997 championship. After a disappointing 2001 post-season that Yzerman was only able to play one game in due to injury, he returned to full form in the 2002 playoffs after playing in just 52 regular season games. He led the league in assists (18) and points (24) in 22 games in 2002, setting career-highs in both categories. In the process, Yzerman and Detroit had won their third Stanley Cup in six years. Yzerman played until the end of the 2005-06 season following the NHL lockout. By that time he was 40 and severely hampered by his nagging knee injuries. When he retired in 2006 he held (and still holds) the record for longest serving captain of a single team (19 seasons, 1,303 games). He finished his 22-season career just eight goals shy of 700 (two fewer than Mark Messier), which is good for ninth all-time, thanks to Jaromir Jagr, and possibly Teemu Selanne for bumping in down the list. He ranks 7th all-time in assists (1063) and 6th in points (1755). He ranks 10th all-time in playoff points (one more than Trottier, three fewer than Sakic). On the international stage, Yzerman collected gold medals at the 2002 Olympics and 1984 Canada Cup. He collected silver medals in the 1985 and 1989 World Championships, and the 1996 World Cup, as well as a bronze medal in the 1983 World Junior Championships. In international play, he collected 50 points in 50 games. Before the 2006-07 season, Yzerman was named Vice-President and Alternate Governor of the Red Wings. His number nineteen jersey was raised to the rafters of Joe Louis Arena in January 2007. He would be inducted into the Hall of Fame in 2009. He is currently the Vice President and General Manager of the Tampa Bay Lightning.